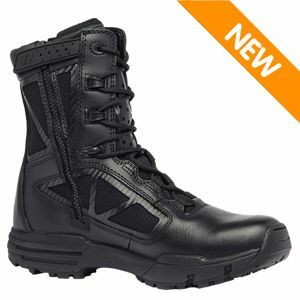 The new Tactical Research TR998Z WP CT Men's Side Zipper Waterproof Composite Toe 8in Uniform Boot integrates the most requested features by law enforcement into a lightweight and durable boot. This boot performs well in wet environments and will protect you from standing water or rain with a waterproof Gore Tex lining. A durable side zipper provides speedy wear and removal for tactical users that need to be ready on a moment's notice. This model adds a non-metallic safety toe to shield your toes for hazardous and electrical duties and makes it ideal for work around airport settings and x-ray equipment. This boot keeps the weight down and your comfort up with a lightweight EVA midsole, made of the same material used in athletic running shoes. Whether you're on regular patrol duty or running an obstacle course, the Tactical Research TR998Z will provide the key tactical features you're looking for to keep you performing at your best.